The junior changed her technique to a two-turn motion and took second at the Millrose Games Trials Jan. 9 at the Armory in Manhattan. 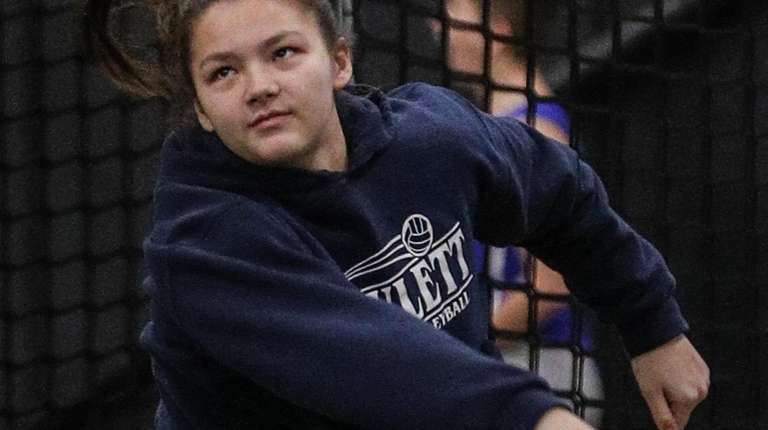 Hewlett’s Kayley Ragazzini has turned herself into one of the best weight throwers in the state…literally. A technique change toward the end of last winter is finally showing dividends and has put Ragazzini right in the center of every competition she enters. The junior spent most of last season throwing with a one-turn technique. Now, after mastering a two-turn motion, she’s coming into her own. “It’s the acceleration,” Ragazzini said of her two-turn ways. Ragazzini placed second in the weight throw at the Millrose Games Trials, tossing 48 feet, one inch Jan. 9 at the Armory in Manhattan. The feet qualified her for the Millrose Games weight throw, scheduled for Feb.7 at the Armory. Ragazzini followed up her Millrose trials performance with a personal best 49-3¼ throw to win the Nassau IV weight throw championship Jan. 11. That championship-winning distance locked up Newsday’s Athlete of the Week honor. The conference championship throw was the farthest on Long Island this season and fourth-farthest in the state as of Wednesday, according to milesplit.com. While the conference championship was exciting — as all championships are — the Millrose Games berth was the real early-January prize for Ragazzini. Qualifying was one of her goals this season and she said she can’t wait to compete in the prestigious meet next month. The junior tries to absorb as much information about her event as possible, watching YouTube videos for technique tips — a practice that is common among throwers. But the videos she watches are only part of the story. Ragazzini, who also plays volleyball, tries to hit the gym as often as possible, getting stronger as the season goes on. This year, Ragazzini said she wants to hit 50 feet, a goal she’s had since the summer. She’s got a good shot, simply because of all the competition she’ll be facing. Ragazzini thrives on being in the thick of tight competitions. In fact, she credited Cheyenne Figueroa of Rhode Island Classical with her Millrose Trials performance. Figueroa beat Ragazzini last week, throwing 58-4. “I think I do rise to the competition because I have a naturally competitive spirit and it just makes me want to do better,” Ragazzini said. The next month will be a busy one for Ragazzini. On top of preparing for the Millrose Games, the Nassau Class B weight throw championships are scheduled for Feb. 4. But Ragazzini isn’t concerned. She’s got in all down to a spinning science. “I think I’ll just keep doing what I’m doing, because it seems to be working,” she said.